Tracey Zeorian was only 12 years old the first time she traveled along the custom wheat harvesting highway. Her passion for custom wheat harvesting was instilled in her by her grandparents and you could say the rest is history. Once married, she and her husband quickly knew they too wanted to follow in her families footsteps and first loaded up in 1990 to spend their first of many summers on the road with their family. Tracey and her family’s story is told through the Great American Wheat Harvest documentary by Conrad Weaver and Jamie Johansen got to sit down with her during the recent 89th National FFA Convention where she was able to hand out classroom versions of the film to FFA members who visited the New Holland Agriculture booth during the expo. This summer was the first time since 1990 the Zeorian family didn’t set out on the custom wheat harvest journey as a family. Their kids are grown ups now and made the hard decision to stay home. 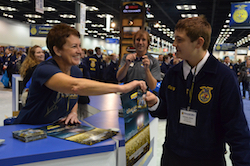 Be sure to check out even more action by viewing the 89th National FFA Convention & Expo Photo Album.